I am at a friend’s place staring out at the peak of the flood. In my town, St George, the hydraulic pressure of the river is forcing its way back up the storm water drains into the centre of town creating menacing pools of brown water inside the levy bank. The water trucks normally used for dust suppression are sucking up the water and taking it to the edge of the levy. Outside the levy bank is the bitter frustration of yet another flood, the third in two years. It is the awesome spectacle of the energy required to lift billions of tonnes of water thousands of kilometres inland for which only a fraction ends up in the flooded river. The energy that is required is beyond comprehension. The temper of the town oscillates between community fervour to an understandable silent brooding, frustration and anger. The juxtaposition is stark between a house on a lawn, and just down the street, a house in the water. The Local Disaster Management Group finds its own rhythm. They call for a mandated evacuation, and most go, but those with a job to do stay and some who are more scared of going than staying hide while others just completely ignore the order. The day for me starts with a quick look around town, public meetings and media and then either sandbagging, getting on the phone and chasing issues through or heading out to where help is required. The smaller towns feel they are forgotten in the shadow of the larger ones while the people on the farms feel they are forgotten by both. All know that sympathy is usually temporary as the world moves on and the logistical exercise of repairs, insurance and getting the cash back into the house to bring back balance is a task that is self reliant with the support of a few friends as other issues will be on the news. However, support during the crisis is overwhelming and genuine. Help just turns up as neighbours see people needing help, neighbours being anybody who see it in their heart to help. Teams of people swarm around houses to try and protect them from the fact that they know that the level of the house is below the oncoming flood. Miraculously some endeavours against all the odds succeed while others stand testament to a forlorn struggle. The media look for the picture or the line that sells the story and we are happy, generally, to deliver it in the belief that it raises the prospect of public support. The media look for the hero or the rogue and if they cannot find it they will create one for you. Public figures, such as myself, have to show their wares of public service as you will be more noticed by your absence than by your participation, and of course this leads to a symbiotic, sometimes parasitic, relationship with those that hold the keys to the nightly news. Surely they should have more respect; don’t they realise we are vastly more important than curried sausages? All those media advisers and news producers being bumped by curried sausages. I am listening to a cacophony; the river, ominously loud at the window, Chris Uhlmann throwing to Heather Hewitt on TV and the clang of cutlery in the kitchen as my host and other flood refugees have left the TV to an empty lounge and all have moved to talk about other things in the kitchen. The Balonne River will hit 14m overnight and houses will sit silently in the moonlight with the river running through them. Ladies will cry with frustration and sit with their husbands and partners and ask where the money will come from this time to repair the damage and bring back balance. Wayne Swan is talking in the background, something about the NBN. Adjective: Engaged in, involving, or reflecting deep or serious thought. I would suggest that the above essay demonstrates this to be an attribute clearly shared by the good … and eloquent … Senator Joyce. The out-of-control kindergarten we call “Parliament” resumed this week, did it? It is indeed rare to have someone as perceptive of reality as Senator Joyce in politics today when most members of “Congress” (USA) or “Parliament” (Australia) behave like out-of-control kindergarten while the most world’s powerful leaders band together with self-serving scientists and economists to control (rather than to serve) the public by using public funds, computers, honors, and models of reality as substitutes for reality. b.) Using expensive computers to forecast the future from Nobel-prize winning models. Today society is crumbling worldwide and we are all trapped, like rats on a sinking ship, with the politicians, scientists and economists that led us here because they seriously believed the output from expensive computers based on Nobel-prize winning models of Economics, Climate, the Sun and Interactions between Neutrons and Protons. Why? Fear of mutual nuclear annihilation – probably driven by the total vaporization of Hiroshima in 1945 and the Cuban missile crisis in 1962 – convinced world leaders to unite nations under a one-world government guided by the the “best models” of democracy, economics and science that money could buy. A great summary. Won’t affect me, but I do fear for my and others grandchildren. Must do all we can to try to return to what we were before all this beating of chests by unrealistic dreamers who make sure they feather their own nests. Abominable and very concerning. Barnaby Joyce is what Australia always stood for .. help to neighbours, tackling the hard yard before own ambitions, mucking in when needed. We’re behind you Barnaby. Julia and her cohorts should be up there too getting their feet wet and helping people. SES amd all those doing their best in this crisis are truly good Australians. Talk is cheap, action is honourable. Time for Abbott to organise a ministerial reshuffle. Big Joe just isn’t up to the task. The fact Judith Sloan can articulate the Coalition’s economic message better than the Shadow Treasurer is a damning indictment . 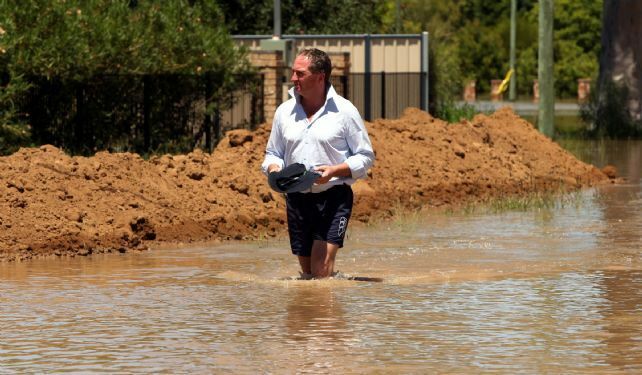 Would like to see Barnaby back in an economic portfolio, but I fear that will not come to pass.